A preliminary design for a battleship to be funded in Fiscal Year 1917, sent on 28 March 1916 to the Navy Department for consideration for construction after the Tennessee (Battleship No.43) design. This design was similar to that of the Tennessee, differing in having two twin and two triple 16-inch gun turrets rather than four triple 14-inch gun turrets. This was the easiest way to provide a ten-gun 16-inch battery on ships of about the same size, but required use of triple 16-inch gun turrets, an untested design. None of the Navys top leaders recommended this design and it was dropped. 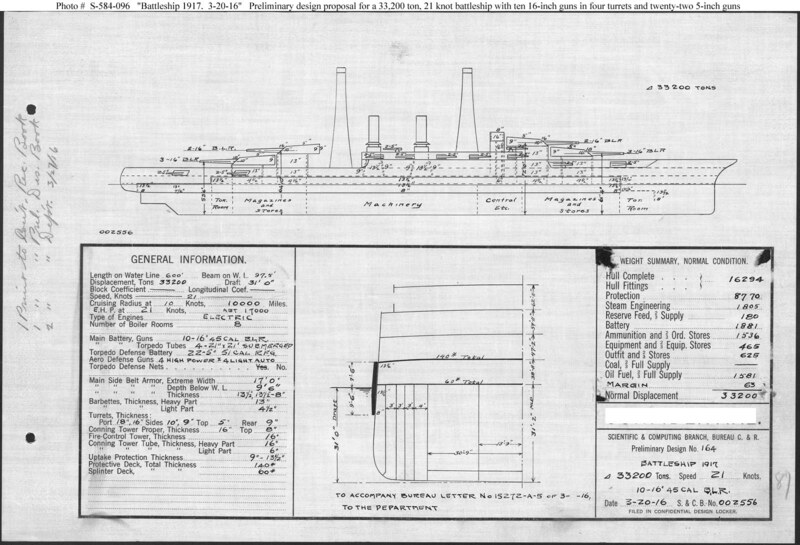 This plan provided ten 16-inch guns, electric drive machinery, and a speed of 21 knots in a ship 600 feet long on the waterline, 97 feet 6 inches in beam, and with a normal displacement of 33,200 tons. Note: The original document was a blueprint (white on black).